Event Planning - Black Sand Coffee Co.
Our Espresso Coffee and Cocoa Bar is the perfect compliment to your next catered event. 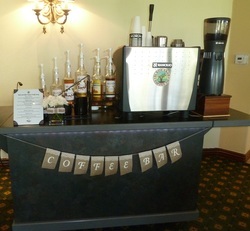 This is our Espresso Coffee Bar - add your own logo or picture for your event. Our Coffee & Cocoa Bar with the "Coffee Bar" Banner. Let us know if you want this for your event. Create your custom event menu by reviewing the seasonal Espresso Coffee & Cocoa Bar Catering menus and decide what 5-7 beverages and what two Signature Whipped Creams you would like on your custom event menu. 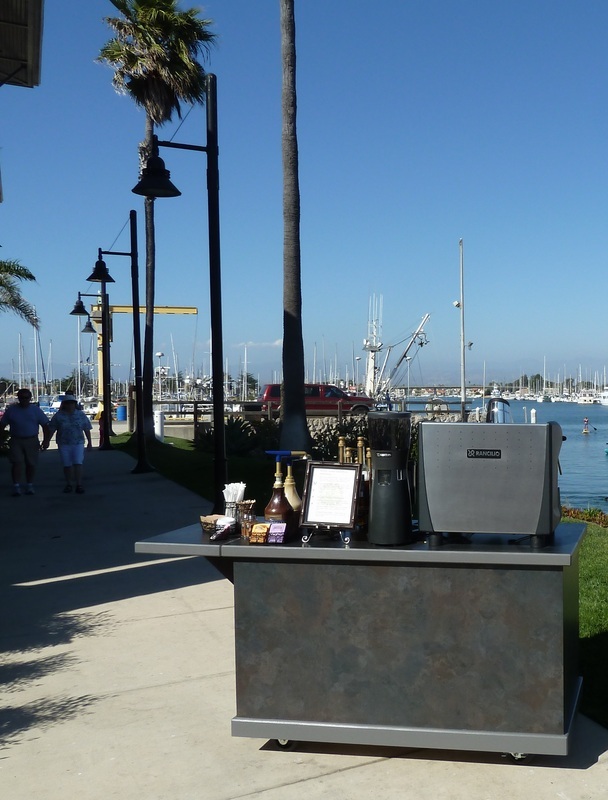 determine the location of the Espresso Coffee Bar and review any other set up needs. Espresso machines and grinders can be noisy! Chose a workable location for our Espresso Bar. The Espresso Coffee Bar needs a dedicated 110 volt, 15 amp outlet. We need an 8 foot by 5 foot space for our Espresso Coffee Bar set up. Doorways that the Espresso Coffee Bar needs to go through need to be at least 32 inches wide. We request access to your site kitchen when possible. We will need to be in our location and be able to set up 45 minutes prior to the start of your event. Please confirm the dedicated electrical outlet is available, working and ready to use. RELAX and partake in the ritual of sharing a great espresso coffee beverage with a friend. 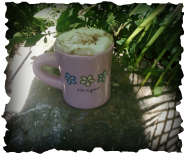 Linda's favorite - Mocha with Salted Caramel whipped cream!